The ZX Printer was made to work with both the ZX81 and the Spectrum (or rather, the Spectrum was made to work with the ZX81's printer! ), but these computers have different expansion ports. What I find puzzling is that although the lines have been moved around, the printer works on both machines. 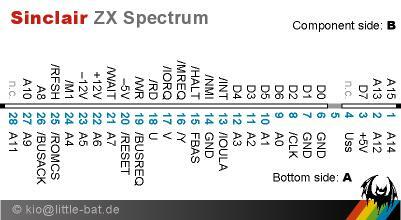 For example, the notch that makes sure you don't insert something upside down is #5 on the Spectrum, and #3 on the ZX81. So the offset is 2. That makes sense, as A0 through A3 and the data lines are all shifted along by two. Same deal with /RFSH and /M1. But then, for example A11 has been moved way over the other side. And /BUSREQ is now +12V, I can picture that being dangerous. How could devices like the ZX Printer keep working on the later computer? Why did they "move stuff around"? Beyond the above, power and GND, nothing else is actually connected between the computer and the printer. 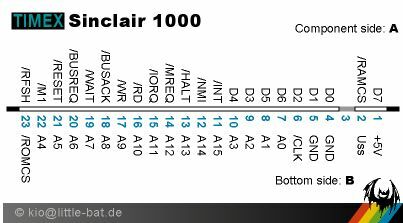 All of the above signals are in the same places (with respect to their distance from the connector key and PCB side, not the pin numbers) on both the ZX81 and the ZX Spectrum, all other signals are simply not connected in the printer - Absolutely nothing dangerous here. Looking at the diagrams you provided, the data pins, interrupt pins, some of the ground pins, and +5v are all physically in the same place (imagine pins 1 and 2 on the Spectrum pinout being chopped off). On the assumption that those are the only pins needed, provided the printer connector has empty space to accommodate the two extra pins on the left and right of the Spectrum interface, and doesn't connect the pins for things like +/- 12 volts to anything, then everything is good. Not the answer you're looking for? Browse other questions tagged zx-spectrum zx81 or ask your own question. Can S-100 cards attach to the ZX machines?